Hydrogen nanobeads could potentially be used like gasoline fuel without speacial storage requirements (Credits: Cella Energy). UK-based Cella Energy has entered a partnership with NASA’s Kennedy Space Center (KSC), to continue research and development on its hydrogen storage technology. The agreement will allow the company to work with KSC as consultant and benefit from its decades of experience with fuels and materials through access to its processes and technologies. “We have a lot of great capabilities at Kennedy and some exceptional talent in both our materials and cryogenics labs and I think that’s what mostly attracted them to us,” said Robert Hubbard, Partnership Development manager at Kennedy. Cella Energy, a spin-off company from Rutherford Appleton Laboratory, aims to produce a low-emission hydrogen fuel that can be used in internal combustion engines with little modification. Hydrogen has long been proposed as a green fuel, as it has it possesses a higher energy density than conventional fuels and its combustion produces mostly water. Its storage, however, presents a challenge to car manufacturers: hydrogen is usually stored compressed, in high pressure tanks at several hundreds of times atmospheric pressure, or in liquid form, at very low temperatures. Hydrogen-powered vehicles using these storage systems would also require considerable infrastructure modifications as fuel and servicing stations would need to be modified for these systems. Cella Energy’s new technology would allow hydrogen fuel to be used on modified internal combustion engines, by storing it inside nanobeads, which are liquid at room temperature. “We have developed new micro-beads that can be used in an existing gasoline or petrol vehicle to replace oil-based fuels. Early indications are that the micro-beads can be used in existing vehicles without engine modification.” CEO Stephen Voller was quoted as saying. Using this new technology, both internal combustion engine and fuel cell powered vehicles such as spacecraft could be fueled with hydrogen-filled nanobeads; once in the vehicle, these would go through a hot cell to extract the hydrogen from the beads. 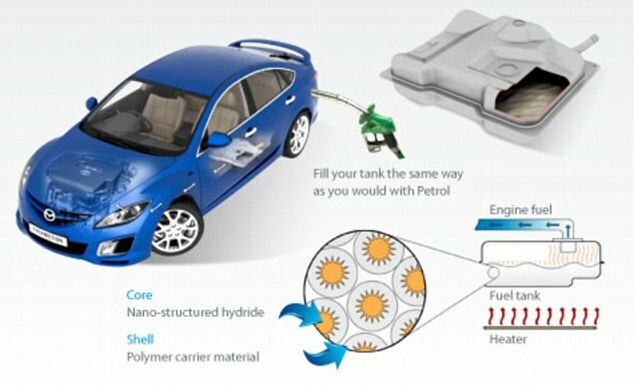 Hydrogen would then go into the engine or fuel cell, while beads would go into a separate tank, to be refilled later. How to actually refill the beads is one of the problems that needs to solved before the new fuel enters the markets; the company is relying on KSC’s expertise and experience with fuel and materials technology to help it overcome the challenges ahead.